Numerify, a startup that specializes in helping businesses gain better insights into their applications, took in $15 million in a series B funding round, bringing the company’s total investment to roughly $23 million. 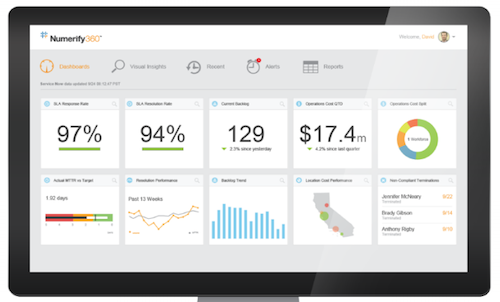 Numerify operates in the application monitoring space alongside companies like [company]New Relic[/company] and [company]Splunk[/company]. What makes the startup different than the rest is that it doesn’t focus on capturing machine or log data nor does it attempt to figure out how well an application is performing for the sake of better functioning IT, said Numerify co-founder and CEO Gaurav Rewari. All the application data Numerify collects is used to provide business metrics for management to make decisions from. The point of using the startup’s service is to discover the costs associated with maintaining the infrastructure that sits behind an application; this includes figuring out how much an organization spends when its IT staff has to work on solving problems, like resetting user passwords so people can access the company’s applications or other common IT dilemmas. The way Numerify works is by plugging into an organization’s infrastructure so it can extract data from a company’s various cloud services; this also includes taking in some financial data, which Rewari said is used to help calculate the associated costs of running infrastructure. From there the company’s technology can transform the data into a dimensional data model that can generate comparisons of the data, like measuring an IT staff’s current response time to a particular incident to what its response time was six months ago. The company invested heavily in creating automation technology to speed up this process of quickly generating data warehouses from which information can be analyzed. Users who have no programming experience should be able to understand the analyzed data through the use of a simplified interface that allows them to see the results without having to “run a single line of SQL code,” Rewari said. The Cupertino-based startup has 85 employees and counts [company]Netflix[/company], [company]Spansion[/company] and InComm among its over a dozen customers. Sequoia Capital drove the investment round along with Lightspeed Venture Partners. The startup’s other investors include [company]Google[/company] Enterprise president Amit Singh, [company]LinkedIn[/company] senior vice president of products and user experience Deep Nishar and former CEO of Palo Alto Networks Lane Bess. Doug Leone, Sequoia Capital’s managing general partner, will join the startup’s board of directors as part of the new funding. Post and thumbnail images courtesy of Shutterstock user Sergey Nivens. The real backstory here is Numerify could not come up with a formidable product in the cloud analytics space. Granted, that space is really competitive with the likes of Birst and Good Data raising tons of money over the last two years and attracting great talent. Still, simply “pivoting” into another market won’t solve Numerify’s woes. As Paul mentioned, the market Technology Business Management (TBM) software is also heating up with companies like Apptio leading the way. The bottom line is that unless they come up with something more interesting, with a high burn rate and costs required to sustain 85 employees, Numerify is not going to make it past 2015, even with this new $15M infusion. Take a look at http://www.apptio.com/ they accomplish this and have been around many years.